At the point of the hand-in for consolidating practices ii I had started to add the layers of depth to the body of work focusing on prisoners. This depth though nested in general thought primarily resided in context from a specific piece of text, Foucault’s Panopticon and its associated ideas. This really helped me to understand the work, myself and the subject matter I was working with in a different way and underpin the nature of my practice for this body of work. The hand-in provided a watershed for my life in more ways than just for the work. I can only explain how I moved forward with the body of work by talking through my personal life. I had left my job of four years and my girlfriend and I had split in the time leading up to this. I had decided to take a role assisting a commercial photographer for at least the summer and dedicate myself to making a financial career out of photography. This assisting role did not go well, despite having got on with the photographer in the interview I quickly realised that he was not the sort of person I would like to work with. Rude, temperamental, and frantic, he created a working environment that I didn’t feel comfortable with. I did however continue for a few weeks as I needed the money to survive. It reached a head with being blamed for multiple problems that were not my fault and being told on a long car journey why I didn’t understand the photographic world. I am not oblivious to the fact that some of these problems stemmed from the fact I am not a fresh faced assistant ready to give myself to a photographer, but the persistent blame games and power play’s made by this photographer were the main root of the problem. I was sat in the sun one lunch break thinking of how much I wanted to get out and make my own work and that working for Jason six days a week was negating that. I quit at the end of the Job we were working on and decided to try something else. I thought I would take a part time job to support myself and allow me to live. One week later I had an interview for a part-time role in a warehouse, this seemed mindless enough to me to allow me to focus on my work outside of the job and the money would be topped up by the different freelance bits that I do. Then later that day the interviewer rang me to offer me a role as assistant managing the warehouse (funny right). Better pay, the same three-day week, perks etc etc. They said I could take this role, or I could take the role I originally applied for, the only caveat being that I would have to do a one-month full time training period for the better job. At this point I sat down with a bottle of wine and just thought for a good few hours. I worked out my money (which was painful) and thought about every option imaginable that I had. Where was I? where did I want to go? how could I get there? An inkling of an idea came into my head. The week previous I had gone to visit the Captain of the ship I went away with and he had loaned me his sisters old Pentax 67. I had already checked to make sure that it worked, and I found that the pictures it made resonated with me in some way. I always try and own two cameras as we know they can often break, especially film cameras, and if someone needs you to take photos you need a camera you know and understand. Most of my new work had been made on a waist level Mamiya, and my Mamiya rangefinder had been sitting there for months. I swapped this rangefinder out for the Pentax and decided to sell it to the University. This would cover me for three months of living/submission/film. I rang up the warehouse manager and apologised and said I couldn’t take either role he had offered me. Rather than dedicating myself to someone else’s photography or workplace, I was going to dedicate myself to my own work. For the first time I had a small financial cushion which meant the entirety of my time was my own. If you make lists, then you understand others who make lists. I had been building up a list pretty much since starting full time work, one that I could not seem to reduce. Things would be added to it quicker than I could cross them off. I wanted to clear and consolidate this list before continuing with my work and in less than a week I did. I moved into a new apartment, re-decorated it, and in down time got through all the minutia that had been weighing me down. I also found myself reading again, a mixture of things, novels, articles, some related to my work, some not. When all this was done, I put my work up on the wall and tried to make sense of what wasn’t quite working for me. It’s funny, you can be excited by work you are making but when something is off about it, it consumes you. I cut all but five photos, five photos which contained the backbone of the work and where it resided in my heart. From there I went out and shot. I don’t fully understand why, but I know that if I spend enough time in the world, I will find the moments I need. I removed all stigma about the circumstances of making images for this project. I did not need to meet any new ex-prisoners at this point, I did not need to be in the areas surrounding prisons, I did not need to be alone on long thought out journeys, I just needed to be out shooting as much and as often as I could. These periods of time are rare, I have felt it before but not had a vocation with which to apply the feeling to and as such have been left with a lot of photos which are a minefield to make sense of. This time however I was guided by a directed mindset. I was still trying to make sense of these men I had spoken to, I was still trying to make sense of myself through these ideas. 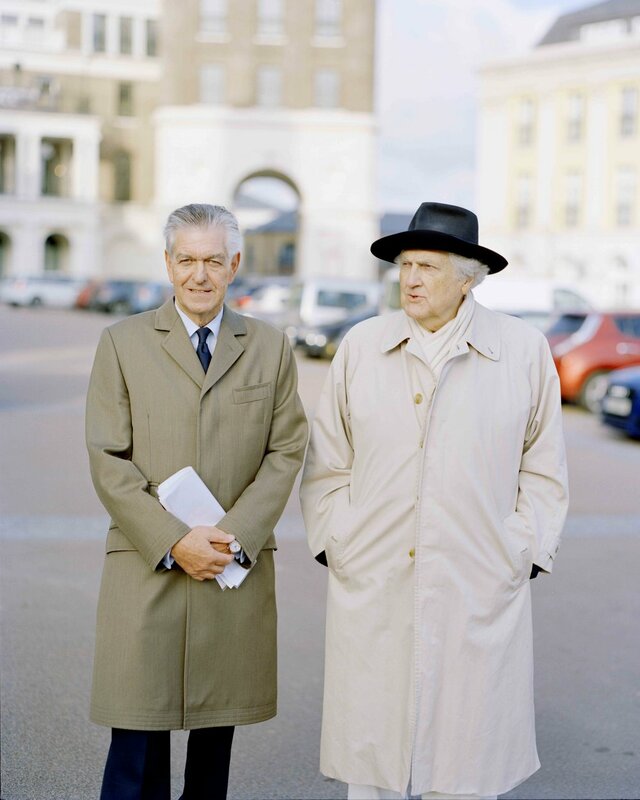 Whilst out shooting I even came across two men who provided further insight into the subject matter, purely by chance. Over the following months I shot around sixty rolls with the pictures spanning the width and breadth of England. I set new parameters to get me out in the world, hunting for areas thick with history, ancient trees, folklore. It was not that these were places that would eventually end up being the photo, but they would allow me to be out, searching for something. Please find documentary evidence of this below. The depth of the work became vastly more varied in an organic way. Ideas I previously had been revised. Reading Criminal Conversations by Tony Parker was a goldmine of further conversations with the types of prisoners I would never get access to and really freed me up to make the work without as much pressure on any research purposes of the conversations. This also led me to revise thoughts of mass inclusion of text/the conversations with prisoners within the work itself. This is not to say I would not include the conversations, but I am now open to the idea of not needing quite so much context. The idea of the tower was still ever-present however with further thought I knew the phrase created too much of a sinister edge to the work. Through my shooting I had researched Folly’s as one of my exploration tactics. These are often tower’s and are an architectural term referring to buildings that are constructed for ornamental instead of practical reasons. I found this referenced the tower yet also referenced the very nature of the work itself. Further reading of Herman Hesse, John Stuart-Mill, John Berger, Soren Kierkegaard, Jean-Paul Sartre all added to my considerations around Epistemology and its associated constituent parts which are integral to a lot of the searching in my work. Having followed Der Greif for a while I keep an eye on their open calls (usually free), and this one popped up and looked like an interesting way to get my work shown. it’s theme, loosely based on migration, also felt appropriate for the nature of my work in a less than obvious way. 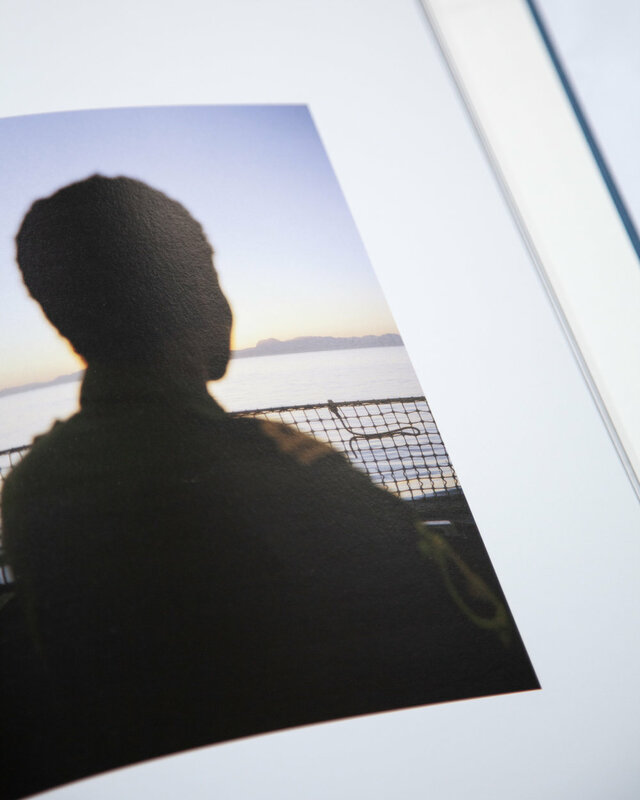 I submitted three images from Albatross and the image of the marines working out on the deck of the ship was selected by Salvatore Vitale. You can see the article of the initial selection and the various ways they were displayed here. What was really interesting about this call is the amount of physical exhibitions that have happened since the initial showing. After showing the collage Minimum studio took the individual photos, framed them and showed them at Manifesta 12 in Palermo, an art and culture Bienalle, and then at Comodo64 in Turin. This meant that along with the online gallery the image was shown physically as part of the group show three times. I have entered the Royal Photographic Society’s International Print Exhibition a few times before but not been selected. I feel it is a similar competition in that respect to the Taylor Wessing, I will probably continue to submit images every year. It feels mildly cut-throat to say this but upon seeing that out of the judges I knew three of them in some respect I hoped it would hold me in good stead. It was nice to see that Jack Latham wrote a piece of text about the work to go alongside it in the exhibition. The Metro Threshold was an interesting call for me to enter. As much of my work is based on the idea of relationships between images, to enter a single image contest often feels a disservice to imagery. However moving forward I have been focusing on creating images that can act in a standalone manner as well as supporting each other, and with my portrait of Soul defining my current work I thought this would be a good moment to put something together around this portrait. The prizes included an exhibition in Metro’s entrance area (a very busy place for photographers), £1000 print credit and a mentorship with Steve Macleod. My submission can be seen below. My interest in documenting modern institutions defines my practice. Moving through topics such as warships, prisons and boarding schools, I aim to interrogate and represent the varying aspects of these environments utilising a number of techniques relating to the notion of documentary. This particular image shows Soul, an ex-prisoner. Rather than making work limited to my interpretation of this environment, these portraits alongside the individuals stories who experienced prison, aim to better represent the modern myth of incarceration. I was shortlisted and exhibited for this award and then was incredibly happy to be selected as the overall winner! I am yet to use the £1000 credit however I have had an initial meeting with Steve in which we have talked through putting me in touch with a number of galleries, agencies etc. However first Steve is setting up a meeting with his gallery in which I will take my materials as a practice in advance of going to anyone else so that they can give me advice and tips on anything that I could change about how I present my materials. Similarly I have agreed with Steve to go to agencies a few months into this year as I would like to produce a more commercial body of work that can go in as a portfolio piece alongside my two primary projects. I will talk about this in another post. Also I was interviewed by the team at Metro which I have included below. I am usually a serial consumer of photography, unusually during the summer period I really struggled to enjoy any other photography other than making sense of my own. Even books I have long found as go-to inspiration did not seem to suit my current sensibility. This carried through into the printing stage. Once I had access to the darkrooms in university after the summer break I developed and went through the images I had shot. Narrowing these down I started to print them in the darkroom, something I had intended to do since starting the course here at UWE but had never found the time needed. I instantly understood the merits of this process. Defined by limitations you are focused on making the images work independently of each other, and as time moves on how they are informed by and inform the images around them. I had got a quarter of the way through printing my images from summer when I headed to Southend-on-sea for an opening at the Francesca Maffeo Gallery. Already interested in the idea of representation I had been invited by a friend to go to Tim Richmond’s opening of Love Bites. Tim has been hand-printing his exhibition prints in a small darkroom in his home for a while and offers workshops in this process so I felt it would also be good to assess these prints and the pros and cons of working this way. Speaking to Tim about his work I could see the same searching in him as I had experienced and though I didn’t love his work at this stage I definitely took a lot from it. At Photo Meet earlier in the year I was supposed to see Francesca Genovese (Director of the gallery) for a portfolio review which we briefly talked about and she asked me in the day after for a chat and to see my work. I took in both works in prints form along with the small selection of my new work printed out to show the direction I was moving in. Francesca definitely understood the work, mentioning the synergy between the two bodies of work and the idea of moving forward with the school work. At this point I had hand prints of only the newer pictures, and digital prints of the older work. I could see as I spoke to them that what I needed to do was to start afresh with the old pictures. To spend a few weeks in the darkroom printing everything again. The very niggle that had bothered me about the work before was one rooted in its aesthetics, and I could potentially find the answer for this by spending time with the images, working on them in a new way. Francesca agreed with this and wanted to see the work all together as a whole including all three subject matters. Tim was also here for some of this review and though didn’t give much away pointed out images that did not sit as well for him and those that did. After Tim left, Francesca offered her future help and seriously suggested I get in touch with a man called Rodrigo Orrantia who she believed would be very interested in my work, specifically with my interest in craft and careful thought around bookmaking. I spent the next few weeks putting together a larger edit of work prints including a lot of the older pictures (though I am still yet to go through and print all of these). To begin with the prints were alright but not great. After the second session of printing they were much better and more in line with how I would like the images to look. This had made me think about my process in advance of dissemination. I feel much more content working on the images in the darkroom, the time spent also helps me to have consideration in advance about the thoughts behind the work, any potential sequence or pairings, and even general aesthetic decisions about the output of the work, be it single print, portfolio box, or book. I have also now managed to re-create the results through scanning digitally and producing the files that way, meaning I can work files off the aesthetic decisions made in the darkroom to produce high res files for other methods of digital printing. The Aint-Bad submission was one I felt was well worth the money. Thirty curators (a selection of editors, publishers, photographers and educators) would each select two photographers to be interviewed for the magazine. Even if you weren’t selected for the magazine then the Aint-Bad team would select 100 people to be featured on the website/instagram. There seemed to be a good vibe coming from their want to include a high number of individuals and the range of ‘curators’ they had chosen. Having seen their magazine before I knew it would be made to a good quality and I had known of them for a fair amount of time. Also their submission included up to 20 images, which I thought was a great amount to really showcase Albatross and give it a chance in one of these large open calls. I was lucky to be both selected for the magazine by Paloma Shutes (the Photo Editor of the California Sunday Magazine), and by the team for the online feature. 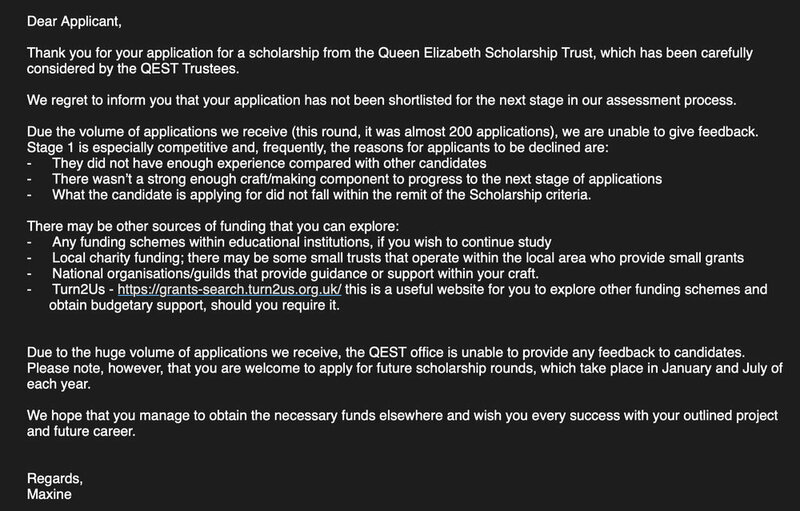 The Queen Elizabeth Scholarship Trust is an organisation I have been in touch with since the end of 2017. When I started my Masters I was considering where my practice lay and a large part of this resides in my interest in making physical items such as prints and books. I learnt a lot of skills whilst working at a photography lab but I always wanted to push myself, especially with learning more analog methods and techniques for producing better quality products, both for myself and for others. Whilst I was considering this practice, along with photography as a craft, I came across this funding opportunity. I submitted at the beginning of 2018 however I failed to adequately budget and explain what I required the money for so my application did not get accepted. One of the staff at QEST did get in touch and let me know that they really enjoyed my application and that I should re-apply during their next intake (screenshots included). I re-applied with a very similar application, just updated with a number of funded activities (which I had been assured could be changed if needed) in August 2018. I have included the various parts of this application below. There was a focus on bookmaking and involved printmaking processes. A few weeks later Max got in touch to tell me I had passed all the stages and would have to come in to interview. At this point I put together a portfolio of books and prints. My first Albatross Dummy was a little battered so I made a new one with a slightly altered edit, amended text, and better quality build (also a clothbound sleeve to keep it in). I knew roughly the quality that was needed to impress in a situation like this so I was sure to make an edit of prints that could hold it’s own. I took a selection of colour hand prints of my own work and a black and white hand print I had previously made a photographer called Maria (shown below). During the interview I was faced by six judges, each high up from their respective specialities (one was even the Crown Jeweller). 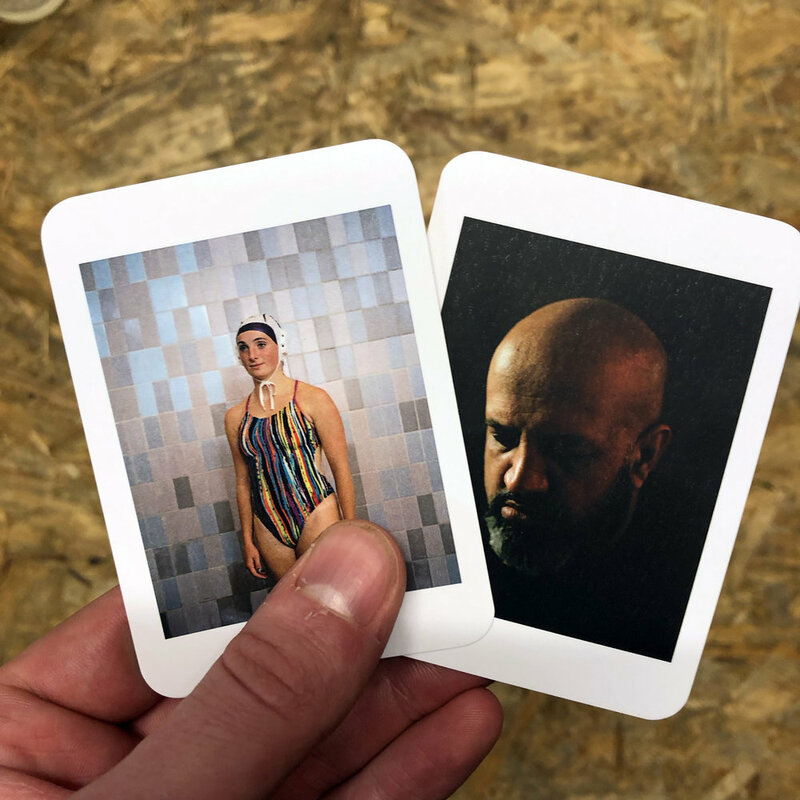 We talked extensively about the varying aspects of what I do, primarily the bookmaking aspect but also including producing prints and it’s relevance to contemporary photographic and visual culture. I know that Steve Macleod from Metro is part of this organisation and had to back out of this interview due to the conflict of interest however for reading between the lines I get the feeling Steve put in a favourable word for me. The interview went well and one week later I received an e-mail saying I had been awarded the money. Since then I have changed around the funding amounts to cover more of my Masters allowing me to stretch my money further into next year meaning I can continue to focus on making my work. I was incredibly grateful and indebted to QEST as it has put me in a much more favourable position (I managed to pay off an ever increasing credit card bill). 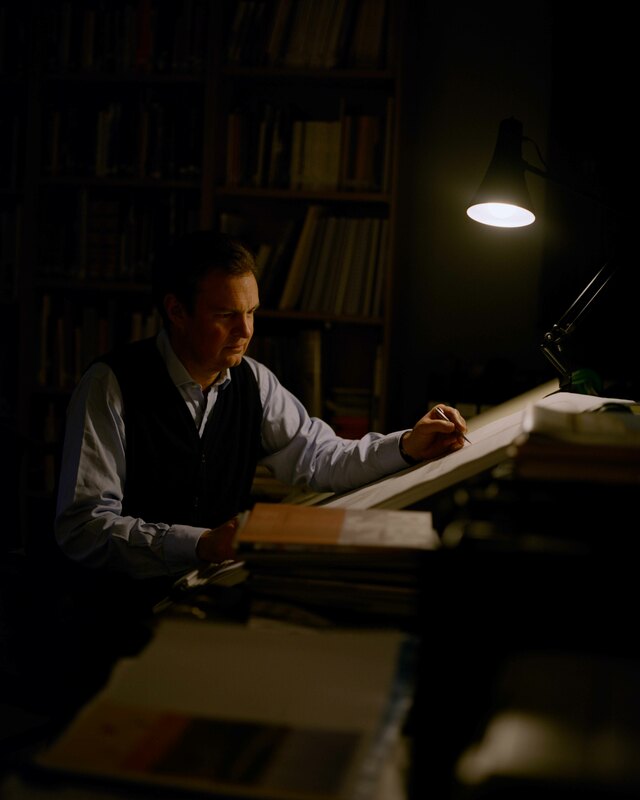 I used part of the QEST grant to fund a printing workshop with Tim Richmond. I decided to put this in my proposal when I had just started to print in the darkroom and as such, I felt like I had a lot to learn. In between that time and receiving the grant however I printed a lot, spent a lot of time working on my images and had created a small portfolio of the folly work. So, when it came to the workshop, I felt it may be not the best use of the money. I decided to do it anyway and to quell any feelings of arrogance, because the chances were, I did not know as much as Tim. I went to Tim’s house just outside of Exmoor, a beautiful old Cider Press. We talked extensively about my work, what I felt it was looking at, and my process. We predominantly talked about my process all the way from exposing of the negative through to how this affects the print. It was a really good two days with time where we talked around the technical and more abstract elements of making the work. Because I knew a lot about the printing side Tim tried to show me different ways of doing things. We printed negatives that were harder to print due to differing light situations, colours etc. It was insightful to see how someone else may print my images. He included more casts than I would be comfortable with, and we discussed what this would change about the images. On the second day we had a long chat about making work commercially. One of the main things that stuck with me was how Tim described working for others on assignments. He enjoyed working more like a cinematographer than a photographer, his mantra appeared to be to light the room rather than to light the subject matter, then you could move around the room more organically. I enjoy this sentiment and will try and consider it in future situations. We also broached conversations on the industry, his movement into personal work from commercial, publishing a book and the varying questions around cost and editioning. Both of us agreed on the increased importance of limited runs, although I feel I have more of a slant towards quantity to get my work out there as well. This may be because I have not yet published a book yet. The two days with Tim were well worth it and I can move forward with lots more to think about. Moving forward with these ideas I am also working on making a limited print run with photographer and Cereal magazine founder Rich Stapleton. I will be printing his black and white fibre-based prints from now on. 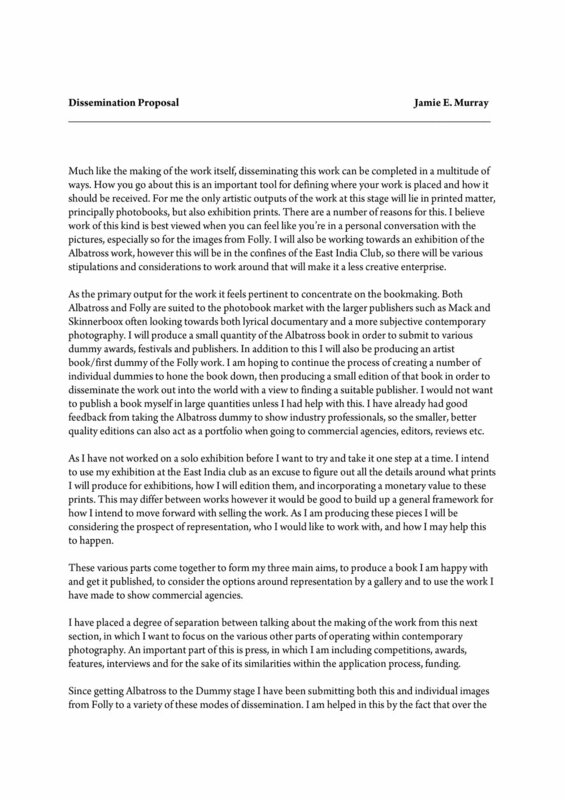 This is something that I hope to help inform my own practice and considerations around printmaking and selling. In addition to this I will use more of the money to take part in a workshop with Alec Soth and Fotofilmic in Vancouver. This will be shown in a separate post. 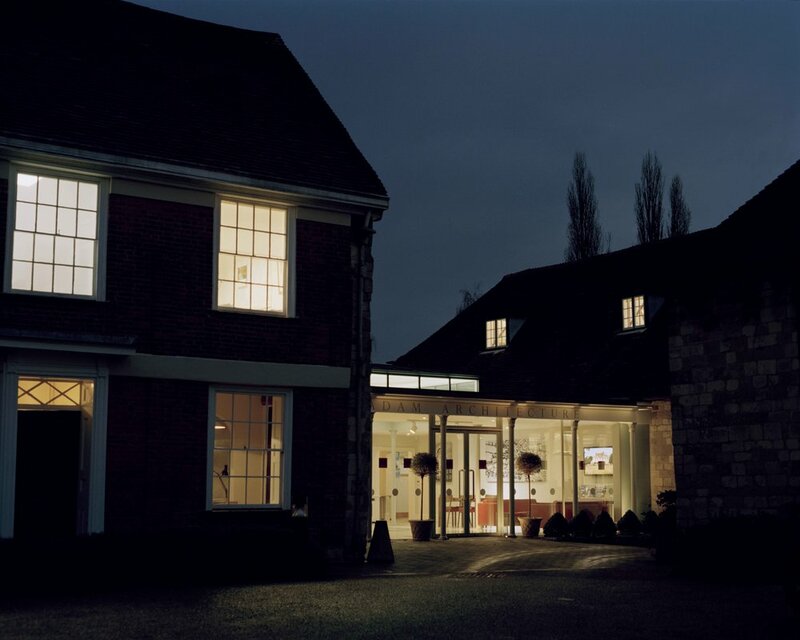 ‘'In 2007, while the photography world was still grappling with the idea of photography as an interpretive, non-narrative, non-representational medium, writer Lucy Soutter wrote about the “crooked” expressive versus the “straight” documentary photograph, insightfully characterising the then two sides of the debate. I applied for the Format 19 Forever//Now open call at the end of July, when I had a finished dummy of Albatross and the beginnings of Folly as an edit of about eight images. It seemed appropriate due to my thinking around my work, it’s relation to the theme, and the fact that I had previously shown the works to two of the Judges at photo meet, meaning they already had a grounding in understanding the work. This was the first submission in which I decided to include images of the actual dummy itself, something I feel is important moving forward as it elevates the materiality of the work. Hopefully this suggests that to see the work completely you must see its physical incarnation. Here I have included my full submission and the images I used to submit. Often when considering the now, we are drawn to the most contemporary of ideas. What I am drawn to is the notion how these very contemporary patterns mirror what has gone before. Story-telling is integral to our existence, and the nature of these stories is often transcendent through time and place. The contemporary culture surrounding the story changes it’s embellishment, but the same fundamental themes lie within. I am interested in marrying up the repeated story told with a representation of the contemporary, the now. Within my works I have been exploring this notion of the story told through the various institutions of our society here in the United Kingdom. These primarily include journeying home with the Royal Navy and conversations with ex-prisoners. The body of work Albatross follows HMS Daring whilst the warship and her crew sailed home from deployment. The ship travelled back from the Persian Gulf via the Black Sea and the Mediterranean. Sailing back from conflict and unsafe waters there was a feeling somewhere between tiredness and resilience, at once romantic and foreboding, a quiet discordant ambience that ran through the sailors, soldiers and their ship, waiting to get home. Seeking to further explore institutions I started to research around prisons in the UK. Transitioning from ships into prisons provided a change in working methods but a continuation of my interest in how we tell stories. Less interested in a traditional documentary approach I instead wanted to hear the stories told by those who had experienced prison firsthand, an approach more similar to a folklorist. Meeting with ex-prisoners, I have a relaxed conversation that offers up an understanding of how the inner workings of an institution such as a prison can affect an individual. The works made include portraits and other images informed by the stories told, these other images are made either right after our conversation or whilst exploring the vicinity of various UK prisons. The works are suited to the pages of a book and as such I create handmade artist books containing these images. I would like to show two unique artist books of these works. The books ideally would be shown side by side. I have provided documentation of an example of one of these books along with images from each work in the submission. I was limited in what I could show so please feel free to get in touch if you wish to see more. It is important to note that I see these works as part of a larger investigation into institutions and story-telling and as such by the time of exhibition I may have enough images from another subject such as schools to provide a third avenue of thought. At this stage there would be the potential of showing either three books side by side or the combination to form one larger artist book. 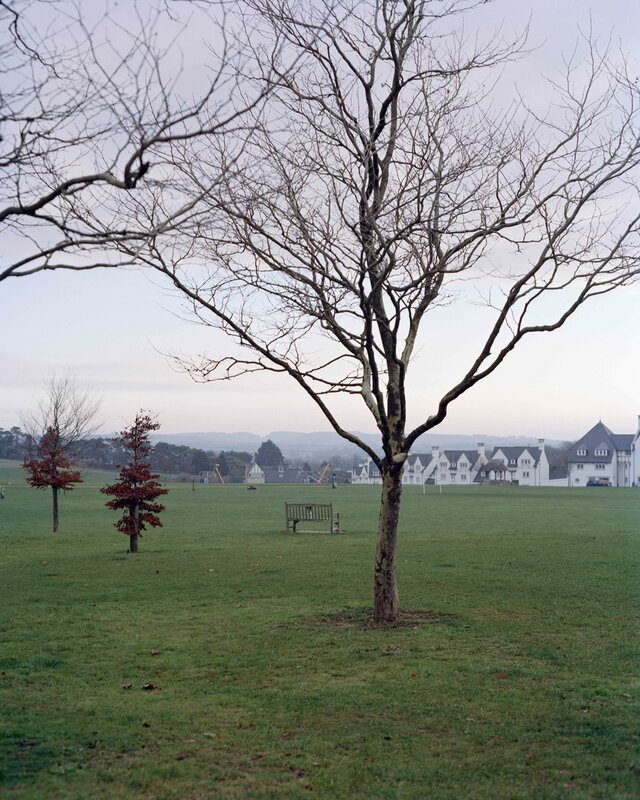 Jamie E. Murray is a photographer based in south west England. 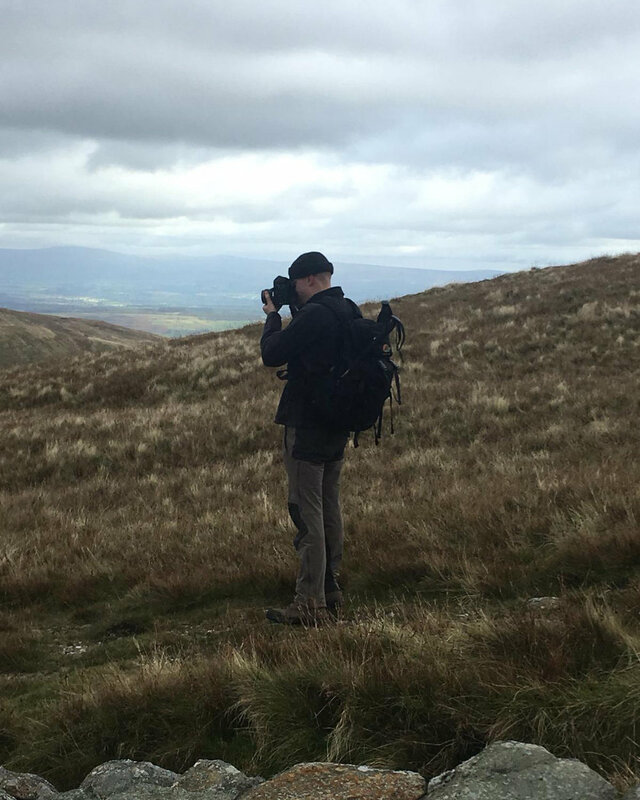 He received a BA in Documentary Photography from the University of Newport in 2014 and is now studying towards his MA at University of West of England, Bristol. 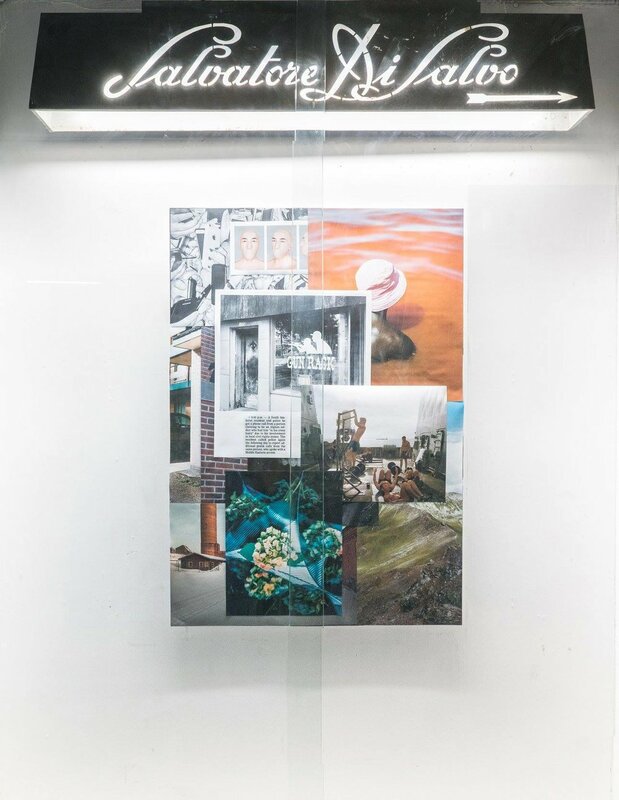 His work predominantly looks at various aspects of institutions, individualism and story-telling in relation to contemporary society and has been exhibited and published internationally. Jamie is spending time with the Royal Navy away on deployment photographing within the ships he travels on. This body of work, Albatross, is looking to capture the ambience of these ships, affected greatly by the physical and psychological conditions of the crew. Moving forward he is also photographing his experience of spending time with individuals who have spent extended periods of their lives incarcerated to gain an understanding of life inside prison. It was great to hear I have been selected for Format 19! Initially both projects were selected but after some deliberation they have chosen to show the first iteration of the Folly work in book form. I went to Photomeet earlier in the year, this was my first mass portfolio review. I had considered doing them before, both when I went to Arles in 2014 after graduating from my BA, and at Format in 2015 a year later. Each of these times I decided that the cost outweighed the benefits with the work that I had. I knew the merits of showing work, even when it isn’t a project that would be picked up. I just couldn’t warrant the outlay as that was money that could be invested into the work itself. Photomeet seemed to come at the right time, I had heard lots of great things about it and I had just produced Albatross into a dummy. Also, I had the initial images from Folly that I could gauge people’s opinions of. I tried to choose my reviewers systematically. As a photographer there are many outlets for work, both commercial and artistic, and as such there are many different guiding opinions. At the time of booking the review I did not want to box myself into one particular way of working so I chose a wide selection of reviewers. I will do my best to summarise thoughts from the reviews that left an impression on me. Most of the reviewers really enjoyed the work, they seemed fascinated that I had made the Albatross book myself and that I had gone to a situation like that and shot it in the way I did. Following from this I started to get a lot of good feedback on the initial Folly work. Critically I was told to consider commercial output and my placement in the industry. What is my subject matter? What am I known for? This gave me plenty of room for thought, however I always felt that the attrition of understanding would begin to appear more the more work I made and showed together. The more editorial reviewers suggest I get in touch with editors to sell the story, this seemed to make sense with the type of work I was showing them however Fiona Shields from the Guardian said that they would not touch a military story, I had been told something similar previously from other editors. At the time I was up for doing this but on reflection I just felt like that one project was so contained and an editorial context of the work would defy the very make-up of how it transmits it meaning. I will be considering potential editorial options if I was to go into a similar situation again, but the same feeling may arise. I feel it would split my mind on what I was there for. The financial benefits of editorial work in this context don’t feel worth the sacrifices made when making the work. I would prefer to focus on the work itself and consider editorial interest about my making of the work, potentially viewed as more of an artist? I’m not sure. This event was a good way to meet Max Ferguson, Harry Hardie and Tim Clarke as at various points I have been told to show my work to them. Each was positive and gave good advice. Most importantly they asked questions pertinent to the work, questions that the work is made through asking. Max was very supportive, and Tim and Harry pointed me towards references, workshops and publishers (amongst other things). I also met with two publishers as a bonus. Because Francesca Genovese couldn’t make it I got extra reviews with Dewi Lewis and Martin Usborne. Both claimed to enjoy the Albatross work yet looked a little lost with what to say about it. I thought about this a lot at the time and put together an idea of why this may be. There is a subversive nature to how I like to make the themes appear in my work. I love the to and fro of watching people try to make sense of it and allowing them the space to do this. I think I enjoy this because I imagine a book I would like to view. More of a riddle than an epic story told. Both of these publishers seemed to be talking only about whether or not they would publish it rather than looking at the work for what it is. Obviously, you would love to hear that they outright want to publish it there and then but upon consideration of both of their publishing houses I had to question whether or not I would choose them based on their books and what I know about their practice. Probably not, there doesn’t seem to be any synergy between work like mine and work that they publish at this stage. Photomeet is an event in itself, above and beyond the reviews. There are talks, parties, the chance to meet people whilst waiting for the reviews. You get to touch base with people you have met previously but don’t see often and most importantly you can put your finger on the pulse of what work is being made. This can be considered in varying ways, subject matter, quality of work, stylistic trends, trends of anything in fact. It’s amazing how many people make similar work within a certain period. I want to tap into the idea of these discourses of thought and output but yet somehow question it through my own work. In early November I was contacted by the team at 3CC, a creative agency based in London. They were interested in getting me to shoot a Portrait of an architect called Hugh Petter for the Princes Foundation Magazine. This would have been the first ‘cold call’ job I would have got as most of the work I have received before was from people that I knew. From the outset both the producer and art director I spoke to by e-mail were very professional, rates were set out and a rough brief was given. However, I was told by the Art Director that I was chosen for the work that I make so not to worry too much and to do what I do. Because of the nature of the shoot, primarily portrait with a few interior shots, I decided to use this as an opportunity to use film on paid work. This is something that I would not always do because of the costs involved however they had offered £350 for a portrait so I decided to take both of my film cameras and make the most of the opportunity. I was given an afternoon with Hugh and the art director Joel to get what we needed. It seemed to me that the art director wouldn’t usually go on all the shoots however because it was the first time they had worked with me they wanted to make sure they got the results. This was re-enforced by the fact that I figured out that a previous photographer had shot Hugh and potentially not a way they felt was up to standard. I over shot the afternoon. I wanted to be sure I got what they needed, and it was a good testing ground for me to see how much I need to shoot to get results for others. I have included a small edit of the selects. They were very happy with the results and asked me to shoot another job the week after. This time it was a slightly broader remit but within a similar framework. 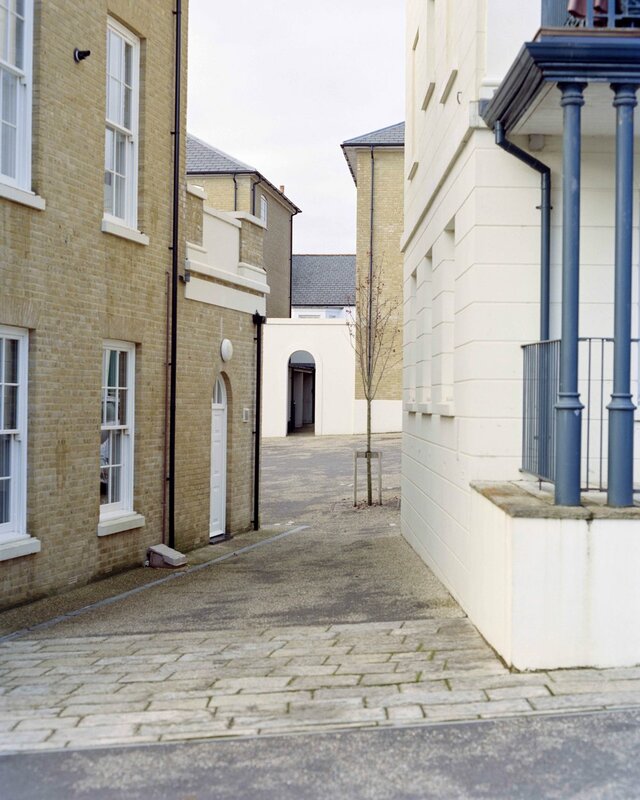 The job was focusing on the village of Poundbury, a very strange place in Dorset. 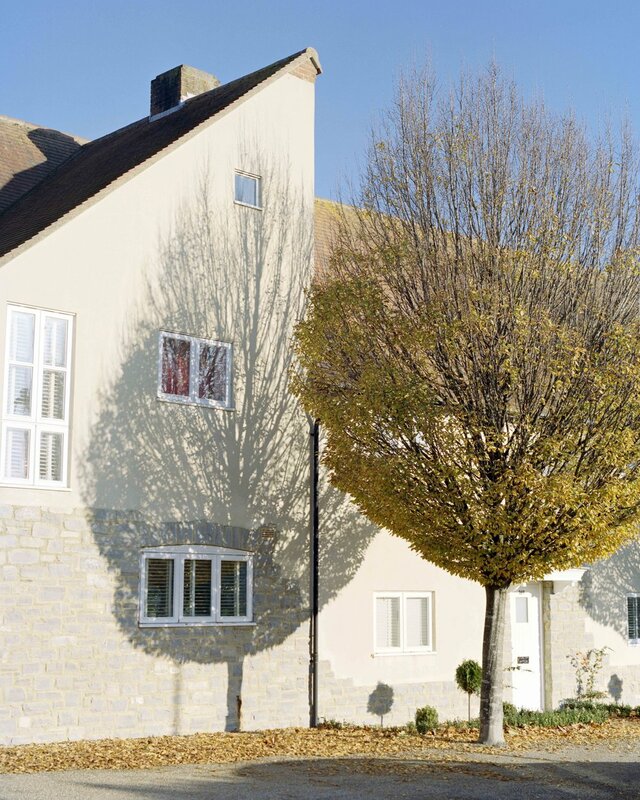 The village is part of a model village thought out by the Prince of Wales and planned and designed by two reputable Architects/Master Planners. I was offered £700 for the day which I accepted. They wanted me to start at 8am but it was a two-hour drive from Bristol so I asked them to cover a hotel nearby which they were happy to do. The day itself was frustrating. Part of the remit was to make the town look alive but because of the strangeness of the place it was very quiet, and I only saw about 4 people for the first hour or two. Thankfully I did come across people and find ways to create pictures to get what they need. They also wanted a document of the buildings of the town, so I was sure to get some shots of this on the way around. The portraits were of two shopkeepers and then of the Architect and Master Planner. The shopkeepers were easy enough, if a little boring to work with because of the nature of small amounts of time with each and the environments within their shops. 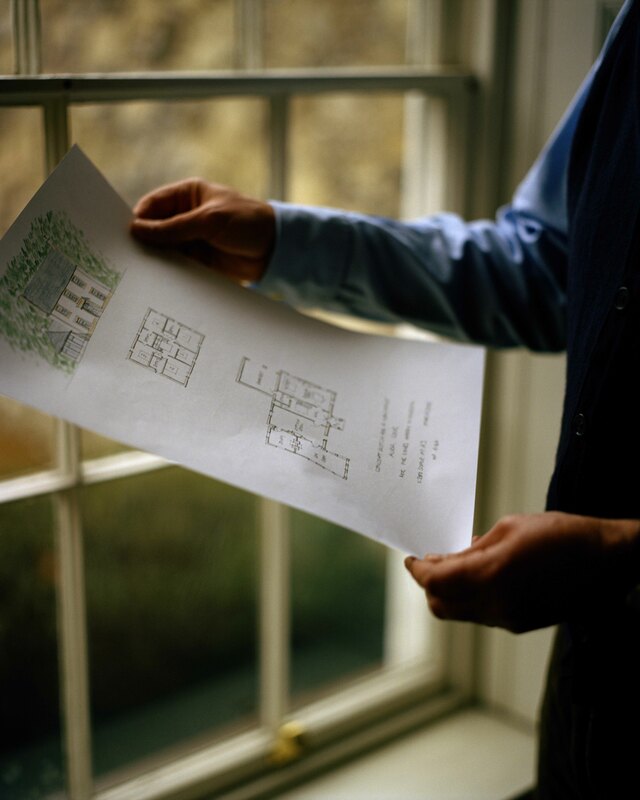 The most frustrating part of the day was the portraits with the Architect and the Master Planner. I was supposed to get individual portraits of both and a combined portrait of the two of them. I ended up getting given 20 seconds to do this in so I only got the shot of both of them. This was due to the fact that they were doing a speed walk around the village with the Prince of Wales and had to run off after him. Thankfully the picture worked well, the agency seemed please and were understanding about the madness of the event I had to work around. I felt it pertinent to talk about both of these jobs in the dissemination folder because they equate to about a month’s worth of money for me within about three days’ work including editing. I am happy with the results, I think they work well for what the client needed and yet somehow still look like they are my images (more so the portrait shoot with Hugh). Even with the frustration of the one shoot I am able to look past it as it is a job for money and the client was happy. I feel like the more work like this I can push for the better the situation I will have for making my own work. I do however think that I would quickly move to shooting digitally for the more mundane work simply for ease and quicker turnarounds, allowing me to focus more time on my personal work. Shortly after this I was also asked to shoot some portraits/promo material for a friend who is a musician. This I have also included below as more examples of commercial work I have been making outside of Folly yet trying to retain some element that make the images feel like they are mine. This year I decided to just submit the one image of Soul to the Taylor Wessing. It was at a time where I only had one from the current series that had been properly printed and felt complete. I felt like I would save a larger selection to be submitted next year. Sadly I was not selected for the second round of judging so I decided to submit to the Portrait Salon award for those refused entry to the Taylor Wessing (and now Portrait of Britain). 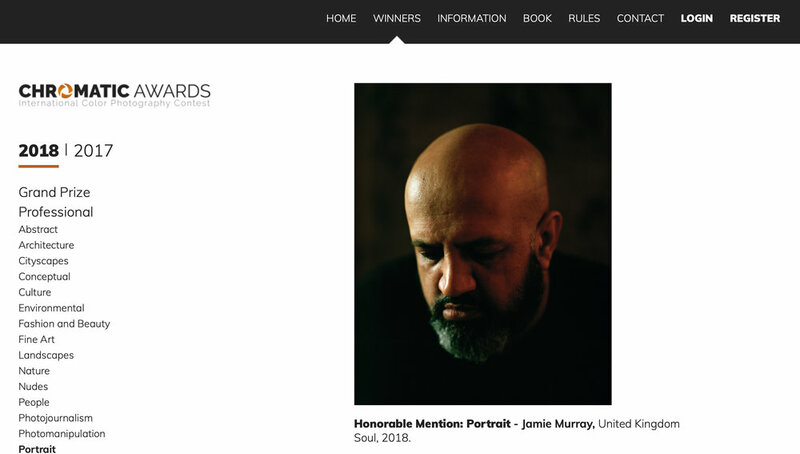 The image of Soul was selected, and as such published as part of a pack of cards for the award. It was also projected at their opening event (please see mine and Izzy’s cards above). Something about this event felt a little lacklustre, potentially there wasn’t much funding this year, but it was still a good way to get work seen by more people and have a social. I submitted to Chromatic Awards on a little bit of an entry spree. I saw the winner could win £2000 and thought it was worth a punt. When I was going back through my entries I was looking to see the quality of the winners of competitions and came across my Honourable Mention on their website. I had no idea I had got an honourable mention as they had not got in touch. Nice to hear, but it’s funny that this lack of professionalism came from a competition I had been dubious about entering from the outset. It makes me question the worth of submitting to all of these various competitions and how much it is actually worth it. Though I don’t want to be too precious I feel I should follow my instincts with what should be entered based on where I think my work should be and what is deserves. I waited till the mid December deadline to submit to the British Journal of Photography International Photography Award. I was working on making better prints of my smaller selection of Folly to make a portfolio box and to submit to the Hyeres Villa Noailles so I thought it would be best to get these done then use the files from these prints to submit the project in it’s best light. I had printed 13 images but decided to submit 12 (the competition was a max of 15). I felt this sequence was enough to carry the work and didn’t lose traction at any point. This was alongside the standard small text for my project. This competition though seemingly difficult to win feels worth entering on the off-chance of being selected. The winner receives huge amounts of press, £5000 production grant, an exhibition and a feature in BJP. It is also nice to see that Simon Bainbridge and Sarah Allen who both saw the beginnings of Folly at photomeet are on the jury. I met two photographers either end of summer and I feel each brought their own thoughts to the work. I had met John before in a portfolio review that Jim Campbell (BA Lecturer at UWE) had set up. I did not have much background information on John when I met him, the work I could view online was limited and primarily commercial. I liked a certain quality to all of this work, but it did not blow me away. I was under the impression John was more of a commercially minded photographer so that was the headset I went into the review with. I asked about agencies and making money. John gave his thoughts on the Albatross work, he liked it and also thought that it could potentially be used as a commercial bargaining chip. The first hint I got as to John’s sensibility was when he said I should stick to printing for people for money and focus on my work as my work. A few months later John came to give a talk at UWE and from it I realised the importance of his personal work. I liked the way he meandered about the work and his investment in it. But most importantly his new pictures were for me, a huge step up from his previous work. They had that illusive quality that elevates a photograph into something of myth and history. I got in touch with him after this admitting to my initial thoughts of his work and asking if we could meet again to talk purely about the work itself. We did this a few months later. Two important things came from this meeting, he introduced me to the work of Tony Parker and his book Criminal Conversations, and we had a conversation about the portrayal of the English landscape. John mentioned that he had not seen anyone show the English Landscape as I was attempting to put it across in certain images from my Folly work. This really helped to push my thoughts towards how I have viewed this work for a while now. I feel the images are thick with history and meaning, something I feel mirrors the landscape around us in a country as dense and old as England. 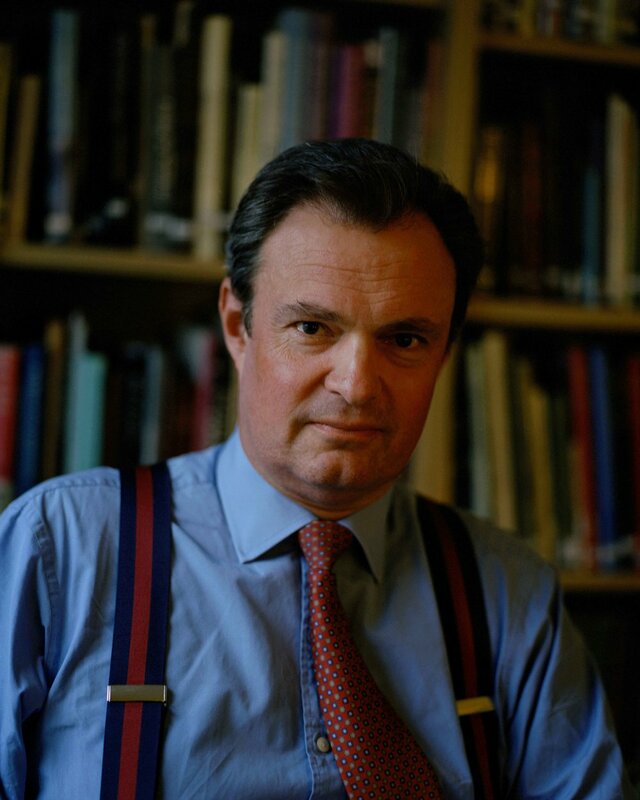 I decided to get in touch with David Chancellor as I felt he was the typical documentary photographer and appears very successful at it. To continue my understanding of what documentary is I wanted to interrogate this way of working and get David’s take on the direction my work was moving in. David was a really nice man, generous with his time and not overbearing with advice. Like many of the photographers I meet he questioned the world around him as well as many of his own choices. David’s primary subject matter is the line where human and animal meet, mainly revolving around trades that work with or use materials from animals. David is an expert on this, he sources his own stories and in a way acts as his own fixer to get these stories to various news establishments including National Geographic. David has a large online following and because of the nature of his posts (including the killing of animals) he can get into some heated debates within these posts. He believes in weathering this and simply being more knowledgeable than most to be able to get these stories told and shown. It is incredibly admirable but obviously a huge investment of his time. Though he does get paid well for someone in his line of work he questions his choice to do this over the much better paid advertising photography. Talking about my work we came to know specific conclusion but from his documentary perspective he believed I should take advantage of my links to the Navy and make sure people know that is my thing, the only caveat being that he thought I would struggle to do this alongside making money from more commercial endeavours. I realised that all photographers face a multitude of options when it comes to situating their practice, and nearly all do a varying range of things to make ends meet. Some of these things are planned but often they fall into place through some guided circumstance. This probably is no different to humans going through the motions in general. It is hard for me to say exactly what I want to do but I would prefer to be comfortable than struggling, the alternate debate that affect this is that I prefer to be making work that matters to me than that feels vacuous. I will aim for a middle ground and see what happens. Context: Submissions, what are they? As I write out my dissemination folder I realise how much of my dissemination will be counted as submissions to contests/ awards/ features etc. This is something I have extensively questioned the reason for in the past few years. I feel like there is a lot to be assessed about the contemporary photographic community and how it works but I do not entirely share the negative opinion a lot have on the lack of work available for a photographers. There could be a number of reasons for the decreasing opportunities in a strictly commercial sense, other mediums have taken roles such as videographers and social media within citizen journalism, the inherent journalistic value of photography has been questioned and thus is used in a different manner nowadays, commercially a small group of photographers could be carrying out most of the work, or just that there is a saturation of photographers at a period of time when the medium we work in is inherently important to understanding visual culture at large. Photography is being produced and consumed and therefore there must be bodies within our culture that deal with this. Often this responsibility is taken on by younger, passionate photographers/curators/editors through magazines, independent organisations, gallery spaces. This creates a new dynamic and increase in so called personal work to fill the spaces created by the various open calls. Terminology becomes a viable way to measure this change. I have seen numerous photographers’ portfolios or websites describe themselves as ‘moving into a more documentary style’ or something along those lines. These are often photographers who would have considered themselves photojournalists before. I feel this movement is twofold. It is because of the opportunities open to the so-called documentary photographer at the moment and also because there is an increased understanding of what photography means within our culture. I try and see this positively despite the underlying nature of an environment ruled by competitions. It has opened up the possibility of anyone entering many of the opportunities available, taking away an element of exclusivity. I believe these submissions are a good way of pushing your work out there but should not be the only method of disseminating work to the varying establishments and individuals that should see them. This is why I try to maintain contact with the various individuals from the industry, especially those that I see eye to eye with. So far I have been writing up submissions that I have been selected for or ones that I am awaiting results from but these are by no means all the of the submissions I have been making. I have decided to combine all the submissions I have not received, some with more of a write up than others. Generally all of these have had a selection of between 5 and 15 images from either of the Folly or Albatross series, with the standard texts used for both. I will state if the submission differs from this. These images were taken on the HMS Daring whilst the warship and her crew sailed home from active deployment. The ship travelled back from the Persian Gulf via the Black Sea and the Mediterranean. 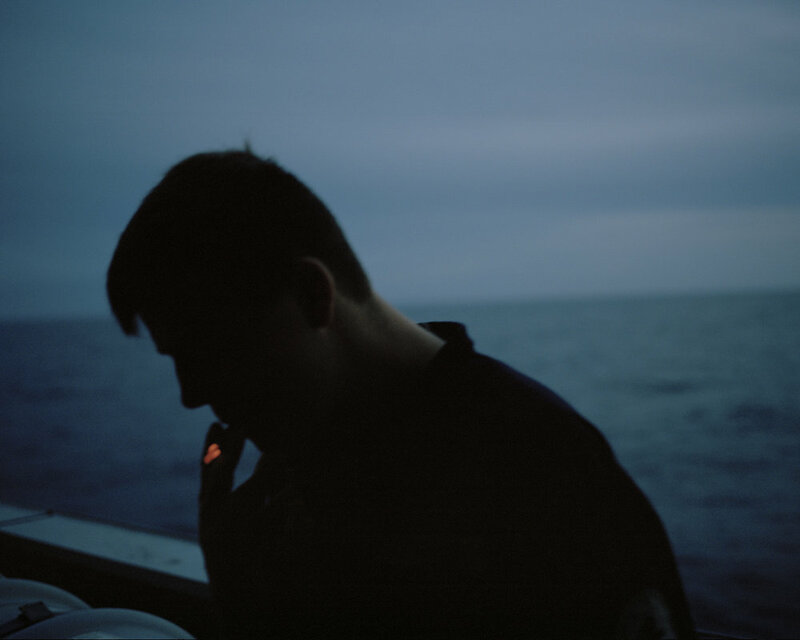 Sailing back from conflict and unsafe waters there was a feeling somewhere between tiredness and resilience, at once romantic and foreboding, a quiet discordant ambience that ran through the sailors, soldiers and their ship, waiting to get home. This work came about through a series of conversations with individuals who have been incarcerated. Within these conversations the ex-prisoners spoke of what led them to punishment, how they navigated the prison environment, and their eventual transition from institution to freedom. Less interested in a traditional documentary approach I instead wanted to hear the stories told by those who had experienced prison firsthand, an approach more akin to a folklorist. The works made include portraits and other images informed by the stories told. Every month, Der Greif run a free open call in which an individual selects a number of images to be shown on the Der Greif website. Sometimes this is an open call for their print magazine. I have listed which selectors I have applied for above. Sadly I was not selected for these however when I met Tim Clarke at Photo Meet he remembered two of the images from Albatross, even suggesting that he thought he had picked them. I feel this shows the importance of continuing to submit. Images seem to work by attrition, the more times someone see’s your image, the more they register it. The Jerwood/Photoworks award was a big submission for me. Though I try not to put too much weight on specific entries, the overall feel of this competition is one of being very supportive to the artists they select. Along with this you also receive Mentoring, a touring exhibition, and up to £15,000 in funding. 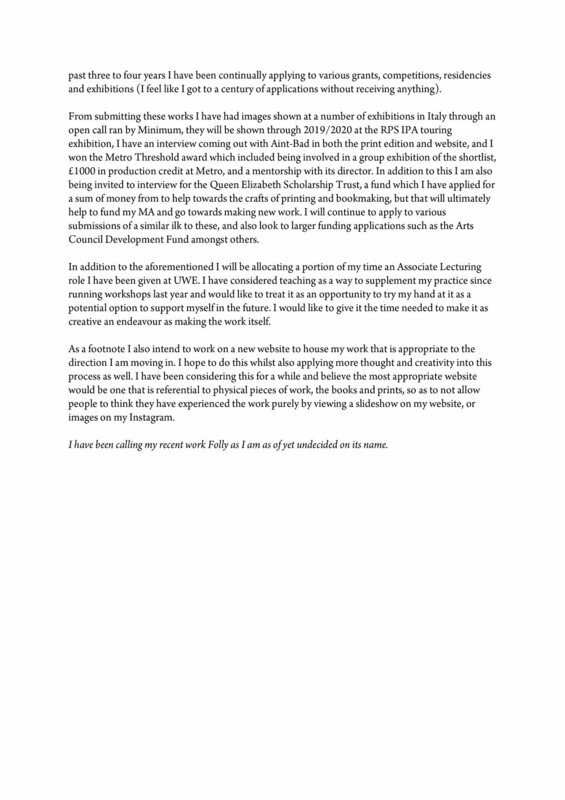 Sadly I was not selected but I have included my written proposal here, this was submitted alongside an artist CV and the images shown above. I decided to not enter any of the Lensculture awards or the BJP Portrait of Humanity competition. Both of these were simple the weight of my opinion outweighing the worth of the competitions. Lensculture seem to be taking advantage of photographers and from information I have received they seem to get thousands of submissions, something I would only be willing to combat if the competition suited my work to a T or the judges looked very interesting. Something about the Portrait of Humanity competition just didn’t sit well with me, I would like to go into more detail as to why but at this moment it is something, I am trying to make sense of. First and foremost, I thought it didn’t quite suit the sentiment of my imagery and it would be throwing my images to the wind. To attempt to describe what I photograph is to attempt to describe attraction. Attraction is not love, longing or agreement. Nor is it rooted in any sense of logic. It is more akin to the word interest. The type of things, places or people you would like to point towards. I do not point with understanding or intent. I point with question and endeavour. As such the act of pointing in photography creates a picture that was made out of the will to question the subject. The single photo is a relic of the question. To continue this process is to build on these questions, to create conversations between them. This is where you must trust your intuition, it will take you to places you do not understand at first but will ultimately be an honest representation of your interrogation of the world around you. At this point rather than moving at the pace of the world, you slow down. The world moves ahead in time, and you remain with your pictures. They help slow your train of thought and increase understanding of a specific moment of experience. You have not been left behind, you have simply moved along a different axis. As part of my QEST grant I have a chunk of money left over to spend on a workshop guided in some way towards making a photobook (this could be viewed in a few ways, physical creation, sequencing etc). Deciding how to best spend this has been playing on my mind for a while, but recently these two opportunities appeared. Something about spending this money seems frivolous so I would like to choose something I would never normally get the opportunity to do, especially if it is a one-off chance that could really help push my photography/understanding of bookmaking forward. The Charcoal Publishing Prize is a portfolio review week in Chico. With a great selection of reviewers that I would choose to show my work to, and the opportunity to win the publishing of a book I felt like I had to submit. The only problem with this was the price of this review week, which with travel would come to just south of £5,000. This is just isn’t manageable for me however there were three fully paid slots available out of the 45 places. I decided to submit on the premise that I could use my funding for the £1,000 flights and travel if I got one of the fully paid slots. In the end I was selected as one of the 45 participants but sadly not for one of the scholarships so I had to turn it down. I have also applied for a workshop with Fotofilmic and Alec Soth in Vancouver. This is more financially viable and would sit within the funding I have left (plus I’d get a week or two either side of the workshop in Canada/America as I’ve never visited). The workshops is named ‘on making a photobook (that matters)’. Because of his impact on contemporary photography and the photobook world I can’t help but believe this would be a great experience that will be an amazing help at a time that I am looking to put together a book of the Folly work. 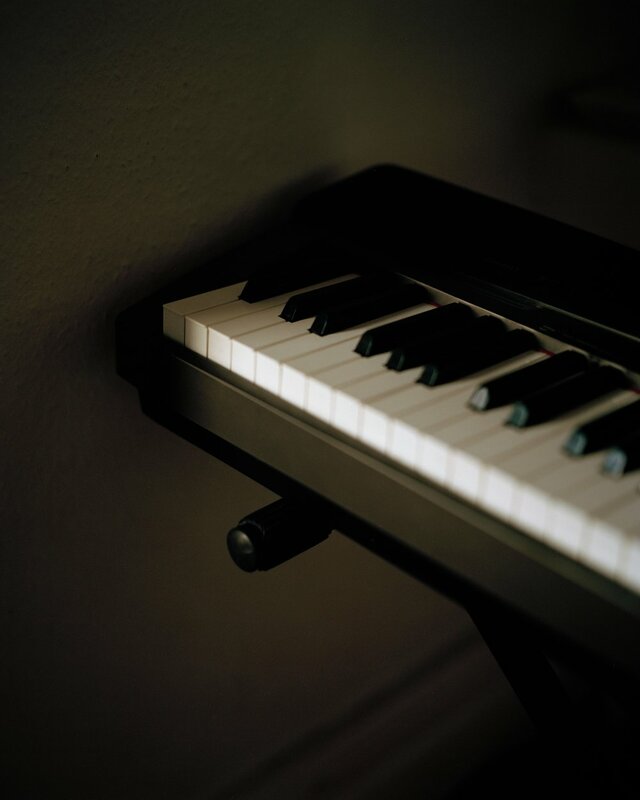 Often in the past I have found workshops and residencies as concentrated periods of focusing on a specific task that really moves your work forward. I can imagine a lot of people will apply for this workshop but I hope that having previously been selected as a Fotofilmic artist, and my current position of having dummies of previous work and an almost realised body of work to will stand me in good stead. I have included my application text below for you to see. People like to tell their story, my work centers around this notion of storytelling. Drawing on ideas from history and folklore, I am interested in the persistence of stories and their relevance to humanity. Looking towards an expanded understanding of documentary within contemporary photography I feel it is important to engage with our subjects in a number of ways, not being afraid to confront, collaborate with and record the experiences we have. I have worked on long-form bodies of work for the past five years since graduating from the Documentary Photography course at Newport, UK. These have included work looking towards the military, sports culture and incarceration. I am now finishing my MA in Photography at UWE, Bristol and also work as an associate lecturer in photography. As a photographer I could consider my work to have a number of different outputs however I consistently find myself drawn towards the way it would sit on the pages of a book. Over the past six months I have been producing dummies of my body of work, Albatross, in the aim to figure out how it could best fit on the pages of a book. This consideration has transcended into the making of my next work, Folly, with the editing process focused on sequencing for a publication and how this could affect the work. This workshop has come at a pivotal time for me as I think about producing my first book to be published and how best to do this. What are you currently working on? What work are you planning on bringing to the workshop? I would like to bring both Albatross and Folly to the workshop. I have finished shooting Albatross and made dummies that could be shown which I would love to hear other’s thoughts on. 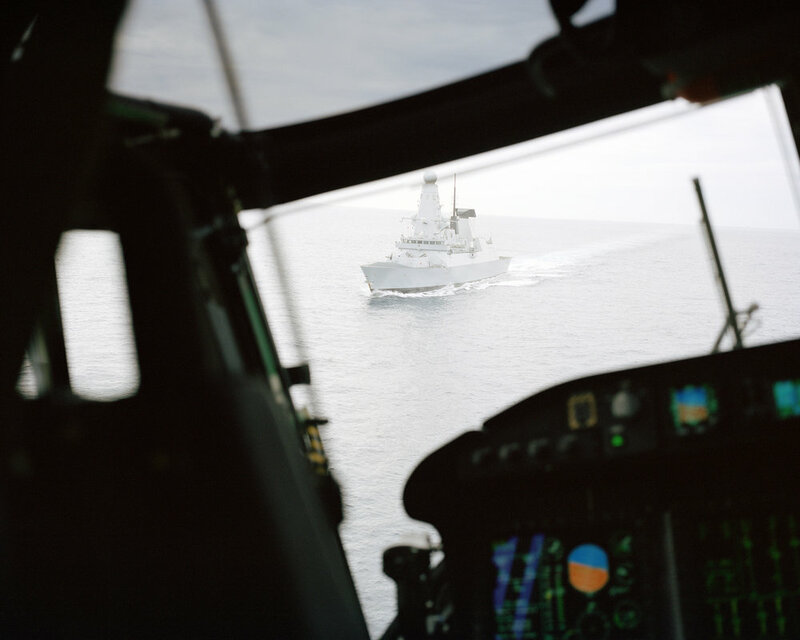 The images from Albatross were taken on the HMS Daring whilst the warship and her crew sailed home from active deployment. The ship travelled back from the Persian Gulf via the Black Sea and the Mediterranean. Sailing back from conflict and unsafe waters there was a feeling somewhere between tiredness and resilience, at once romantic and foreboding, a quiet discordant ambience that ran through the sailors, soldiers and their ship, waiting to get home. I am still in the process of shooting Folly however I am looking to have reached a milestone with the work around the time of the workshop. This work came about through a series of conversations with individuals who have been incarcerated. Within these conversations the ex-prisoners spoke of what led them to punishment, how they navigated the prison environment, and their eventual transition from institution to freedom. Today I received the e-mail below letting me know that I have been given a place on the workshop! In addition to this they chose my image of Pete to announce that the participants had been selected. I can’t often say that I enjoy submitting to awards however I have potentially found a way of submitting that keeps me engaged and excited about what I could be sending across. Sending a mixture of physical items just seems to suit my work and with a combination of the Albatross and Folly work I feel they both speak louder together. This potentially could be first seen in my submission to Format (though not a physical submission it referenced the material with pictures of the Albatross dummy and consideration of the book at the object). 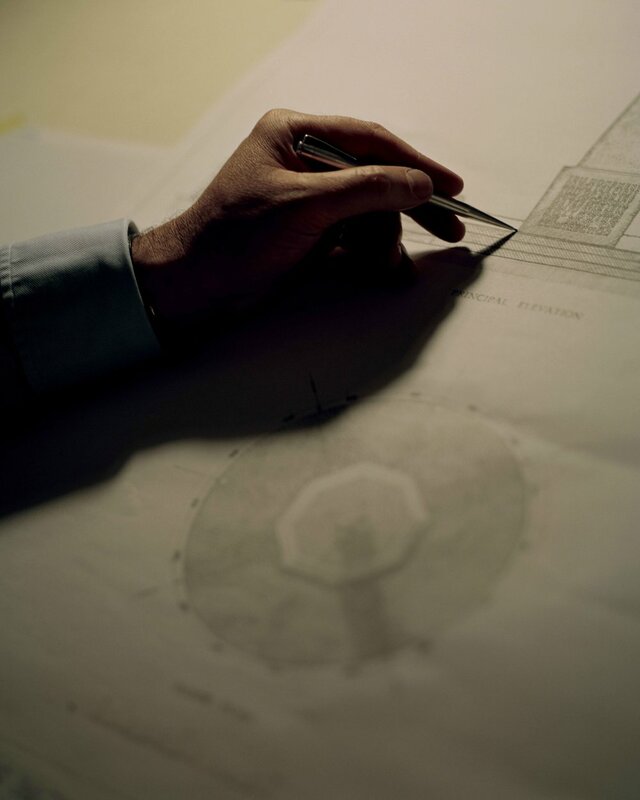 The initial requirements of the Hyeres Villa Noailles submission was 20 pictures total (from two bodies of work) and a completed form with various questions. The form can be seen here and the photographs I chose are shown below. I decided I would focus on producing the best results for this submission as I could, so I spent a few days in the darkroom producing 11 new hand prints of a small edit of the folly work to be scanned for submission. This worked well as I had been planning to make a number of each print so that I had good quality prints to send out/sell, I printed about 15 of each image. I then chose 9 images from Albatross that best represented that work and complemented the images from Folly. Selected artists after this stage were then asked to send across a physical rendition of this submission with prints and any references to artist books we may have (but not the books themselves). Luckily, I had made multiple copies of the prints, so I was able to put a set of these 11 together and add them to my 9 albatross prints. I also included a page showing images of my Albatross artist book. You can see further evidence of this below. Whilst producing these materials for the Hyeres Villa Noailles submission I received the e-mail shown below nominating me for the C/O Berlin Talent Award. I am very grateful to my nominator. The submission was very similar. This time it was prints from one project and a publication of your work. I showed hand prints from Folly and added one of the simpler Albatross dummy’s I have made to the package (they had advised not to send originals as they could not be returned). I was also lucky that I had recently been planning the packaging materials for when I am making lots of prints/books that need to be sent out and had received a lot of these to sample from a German based company. Both of these submissions were sent out at the end of December and without dwelling on them I look forward to hearing the results of both awards.